Open Captions vs Closed Captions: What's the Difference? You are here: Home / Blog / Open Captions vs Closed Captions: What’s the Difference Between these Captions Options? Let’s get into details about the differences between open captions vs closed captions and when to use them both. Captions are the on-screen text descriptions. But let’s not stop there, as it’s not that straightforward as you might think. When Are Open Captions Used? When Are Closed Captions Used? Captions are on-screen text description that displays a particular video’s dialogue, identify speakers and describe other relevant sounds. They are displayed simultaneously with the video image so that viewers can access the visual element of the video and use the captions instead of relying solely on the video’s sound. Although many people would assume that it’s primarily for the d/Deaf and hard of hearing to enjoy videos, there are many benefits of captions which many people don’t think about including assisting those with learning disabilities, access videos in noisy environments and better understand the jargon used. Good quality captions will also include sound effects and music too, which helps to create that added experience when watching videos. Open captions aka burned-in, baked, burnt or hard-coded captions are a permanent feature of the video, meaning that you can’t switch them off. You may have spotted them yourself in various online videos on social media. Since around 85% of videos watched on Facebook are in silence, one way of preventing them from scrolling down past it is by having the open captions displayed immediately. Video content creators tend to take advantage of that as they know that the lack of captions will result in fewer views. Some viewers might find that it’s difficult to turn on captions. This could be because of reasons such as fiddly technology making it hard to switch it on or those with diseases such as arthritis find it difficult to press buttons. With open captions, it is always “switched on” so it removes that hurdle for many people. It also means that you don’t have have to deal with the headache of having a separate video file and caption file, which can be beneficial who those deals with these files often. Another advantage of open captions is that they are also more universal as closed captions require a special device called decoders to make it work. This eliminates any inconsistencies that may occur from using multiple different devices. So because open captions are “burnt” directly onto the video, these decoders and such technologies are not required. Open captions also give the publisher to have the option of choosing the exact size and style of the captions. This will give you a greater flexibility to make sure that it’s as clear as possible. On the other hand, for those who does not want captions, they will not have the option of switching off open captions. This is one of the reasons why closed captions are freely available as you are given the option of whether you want it or not. The other disadvantage is that it is directly tied to the quality of the video. So for example, if the video quality is blurry, then the open captions will also be blurry, which means that it will be difficult to read. This can be a problem when anyone wants to compress videos to save its file size, as that can affect the quality too. It is important to think about what video are you wanting to play and who are your viewers before deciding whether to use open captions. For example, if you have a training video that specifically intended for those with disabilities or will definitely be played at a noisy outdoor screen, open captions would be a good choice. Another option would be at the cinemas. Now you might have assumed that they have the feature to switch on the captions for each movie, but that’s not the case as they won’t always have the special display equipment or decoders required. On most occasions, cinemas that offer captioned films tend to show them as open captions e.g. foreign films. And in a lot of occasions, you tend to see open captions in gif files and memes, which makes sense as they don’t tend to have audio files and they are for watching only. Closed captions, which tends to be displayed as [CC] in many places, are the on-screen text description a separate track. This gives you the ability to switch them on and off. You will most likely have seen the [CC] logo as shown below to illustrate clearly to the viewers that closed captions are available. The biggest advantaged is that you have the option of switching it on and off, so that provides flexibility if you feel that you do not require it during a particular situation. Another advantage, especially if you are the original video publisher, is the ability to quickly edit and re-upload the caption files. Unlike open captions, where it requires create that video file all over again after hard-coding the edited captions. And finally, there are various types of file formats (such as SRT, SCC, RT, WebVTT) which makes even more flexible and suitable for a variety of different media players. As mentioned earlier, closed captions require the help of a decoder to have it displayed so they are only available if the media player used supports that process. These decoders tend to be installed within the television set, cable set-up boxes and games consoles. Another disadvantage is that you are dependent on the publisher to make sure that it’s clear and easy to read. On most occasions, they tend to be in white format. But if the background is consistently in a bright colour, this will make it harder to read the closed captions. And if it’s not clear, you have no option to adjust the format. And finally, the responsibility of turning the closed captions on and off is down to viewers, regardless of whether you are capable of doing that or not. Closed captions are most likely the more popular captioning option (though you’d need research to back that up). On most occasions, you will see them on sites like Vimeo, YouTube and Facebook, streaming services like Netflix and Amazon Prime, scheduled TV programmes, catch-up TV programmes on the likes of iPlayer, video games, DVDs, etc. 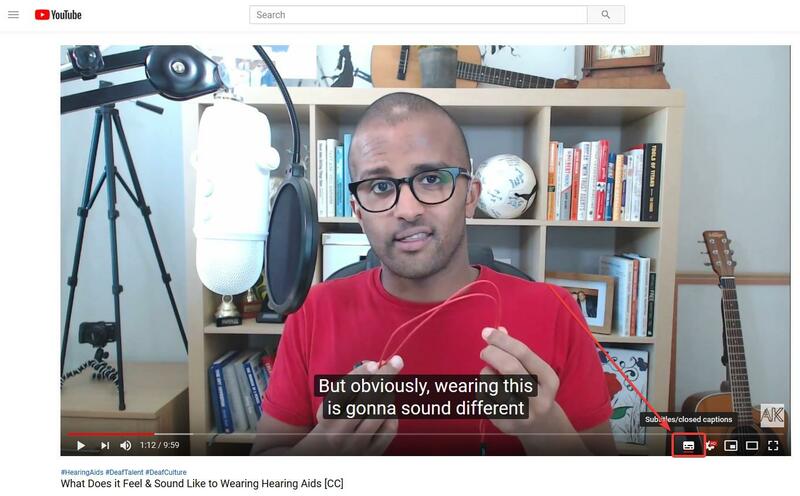 Regardless of what people, there are immense benefits of captions, be it open or closed, though the general assumption is that it’s mainly for the d/Deaf or hard of hearing. Notice that this website has the [CC] attached to it? You probably already guessed that it stand for closed captions and a way to inform you that it’s there if you need. And although it’s not technically closed captions, transcripts are also available by choice when you want to access the podcasts too. There may be times where it is better for me to use open captions instead, particularly on social media. Nonetheless, it’s about understanding when to use it and also having the option to use it. I’m curious though; have known about the differences between the open and closed captions? I had forgotten what the difference was between the two, so thanks for the reminder. Which do you prefer: open or closed captions? Or does it depend on the context? Definitely depends on the context, so it’s really difficult to pick just one. For example, I wouldn’t want open captions on TV or video games, but so it’s better to have the option of switching it on.